What Could Jeff Bezos Want With the Washington Post? Wikimedia Commons image of the Washington Post building by Daniel X. O'Neil. As someone who had the benefit of working for the Washington Post at the beginning of its digital transformation, I will never forget how I got the news that the Graham family is selling the paper to Amazon’s Jeff Bezos. It was through a New York Times news alert on Google Glass, which I was testing out on the Syracuse University campus. Just a few weeks ago, the news would have reached me from a news alert on my iPhone, a few years before that from the Google News home screen or a Google Alert in email, and before that probably from a headline on Yahoo.com or the AOL Welcome screen. That pretty much spans the 17 years since I worked as one of the first online producers for Digital Ink, the Post’s long-forgotten dial-up service, and then the first Washington Post website. "Through Amazon, Jeff Bezos is the only person who has made significant traction in getting people to pay for journalism and non-fiction textual content." Jeff Bezos. Image courtesy of Flickr user Steve Jurvetson and used here under the Creative Commons license. Notice that nowhere did I mention the obvious: by going to the Washingtonpost.com home page. I helped launch that site in 1996, but it hasn’t been a part of my daily news habit since I left the company. This isn’t because I don’t like the company — like most “alums” and journalists, I feel a deep connection with the paper, and dare I say, ownership. I cheered every innovation as if it were my own, and felt the sting of every layoff during its seven years of falling profits. But just like every other consumer of digital information, I did what JD Lasica calls “de-coupling news” from its moorings. 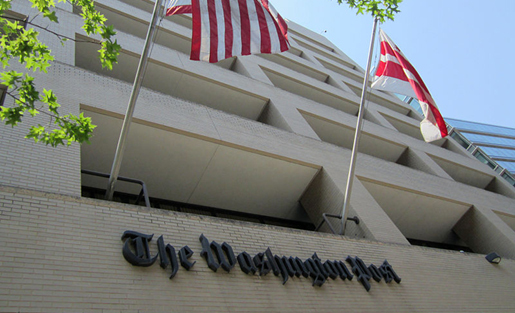 And let’s be honest, it has been sad to watch as the Washington Post — the newspaper that downed a president — failed financially in the digital age after its owner Don Graham had invested so heavily in innovation. This is the crux of the problem for newspapers and, I would argue, every bundled legacy news organization regardless of medium. The rate of change in consumer media habits has outpaced the ability for most media businesses to respond fast enough. But that’s not to say that the Washington Post hasn’t tried to change. It was one of the first to jump online even before Internet access was mainstream. At the S.I. Newhouse School, where I serve as Chair of Journalism Innovation, I often ask students this question. True or false: Newspapers failed to thrive in the digital age because they didn’t innovate. The answer depends on what you’re measuring. For newspapers like the Post, the answer is false when you look at serving its audience in new ways (website, mobile site, tablet apps, a digital TV channel), but true when you look at the business model or, to use the non-profit term, sustainability. For reasons that I can only attribute to basic human nature, people responsible for revenue at newspapers have always tried to hold onto the businesses they had — even as they shrank — rather than risk their livelihoods building new, untested revenue streams. So this takes us to Bezos, and what I suspect is the real reason that he’s interested in journalism and why Graham would say he’s the right guy to continue the Post’s legacy. Through Amazon, Bezos is the only person who has made significant traction in getting people to pay for journalism and non-fiction textual content. You can see the beginnings in Kindle Singles, which are short-form e-books that often consist of reporting and investigative journalism. This is part of a larger trend of news organizations packaging and selling their most heavy-hitting news packages as e-books or apps for mobile devices. In 2012 Bezos gave some insights into his thoughts on the news business in an interview for the German paper Berliner-Zeitung, and made two very interesting comments. First, he said, “On the Web, people don’t pay for news and it’s too late for that to change.” But he followed that with: “People are willing to pay for newspaper subscriptions on tablets.” While he was referring to subscriptions here, I don’t think it’s too much of a stretch to think that he sees potential for other forms of payment — such as mobile micropayments from Kindle devices, or even on the Web using Amazon’s payments system. But is that all Bezos is interested in? In his letter to Post staffers, Bezos didn’t say a word about new business models or revenue, and quite a lot about the need to continue to innovate and “invent.” If this was primarily about revenue, or a benefit to Amazon, I suspect he would have pushed for Amazon to make the purchase directly. It’s about more than that. After I heard the news, I started making a list of what both Bezos and Amazon would get out of this acquisition. Legacy. He’ll own one of the most respected news brands in the world, and if he can make the Post sustainable, he’ll also be credited with “saving journalism.” At a time when Facebook’s Mark Zuckerberg has promised to give away half of his wealth before he dies, saving the Post may be the Bezos answer. Experience with something new. Maybe Bezos is getting tired of e-commerce? He could also gain some valuable insights into consumer behavior that could inform other products and services at Amazon or elsewhere. Washington influence. While Amazon isn’t buying the Post, it’s impossible to separate its owner from this purchase given the Post’s place in Washington politics. I suspect we’ll see this surfaced if and when Bezos, like Eric Schmidt of Google and Tim Cook of Apple, eventually testifies to Congress to defend something Amazon does or fails to do. Washington influence, especially for Amazon lobbyists. A potential testing ground for new forms of commerce-connected advertising. Data! Imagine what kinds of insights Amazon could get from a company like the Post, including comparisons of how people consume news on different devices (especially those not owned by Amazon) to purchasing behavior. Finally, it would be interesting to see how Amazon’s global network of warehouses and Print on Demand operations could be applied to the print version of the Washington Post. Jeff, I wish you the best of luck living up to that kind of trust. And if you ever want to talk to the folks who opened the Pandora’s Box in 1996, you know where to find us. We may still have a few good ideas. Dan Pacheco is the Chair of Journalism Innovation at the S.I. Newhouse School. He worked at Washingtonpost.com as one of the first online producers in 1996, and on Digital Ink, the Washington Post’s first online service before the introduction of the consumer Internet. I am not concerned with Mr. Bozos interest in technology but rather very conservative and anti-democratic politics. Good point. I don’t have any commentary on his politics (I don’t know much about them), but in general the idealogy of the private owner of a newspaper, or any news organization, will always impact the editorial policy to some degree. Having worked at the Post, I know the culture there is very independentm and I I can say that I never observed anything come from above that dictated what we could or couldn’t cover, or how to frame it. If Bezos does push his own idealogies I also suspect that Post reporters will be the first to write about it.